Share your Power BI and Excel pride with the world! It’s about pride – the pride you have as a Power BI customer, partner, or employee. It’s about pride in your work, and in the work of your fellow business intelligence experts. 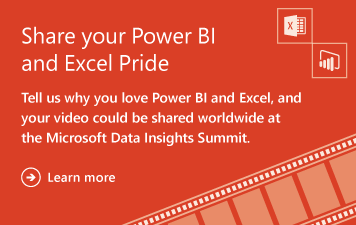 As a valued user we want to share your Power BI pride with the world at the Microsoft Data Insights Summit! There’s no wrong way to celebrate your Power BI and Excel pride, whether it’s about keeping your organization on track or just enjoying how you can use your favorite font in visuals. You can find the full submission instructions and more inspiration for your videos on our Community forum. You must submit your video by Friday, March 11, 2016. Select videos will be included in the Data Insights Summit opening keynote with Microsoft CVP James Phillips, and shown elsewhere throughout the 2-day event to attendees from around the world. All videos that adhere to the guidelines will published on the Power BI YouTube channel on March 22, 2016. This is not a contest – there are no prizes – it’s all about the pride. PS: Don’t forget that participating earns you Power BI Perk points!